My first guided tour of Funcom's upcoming paranormal MMO The Secret World saw me descending into the depths of hell. Many massively multiplayer online role-playing games go there; it's a popular spot. 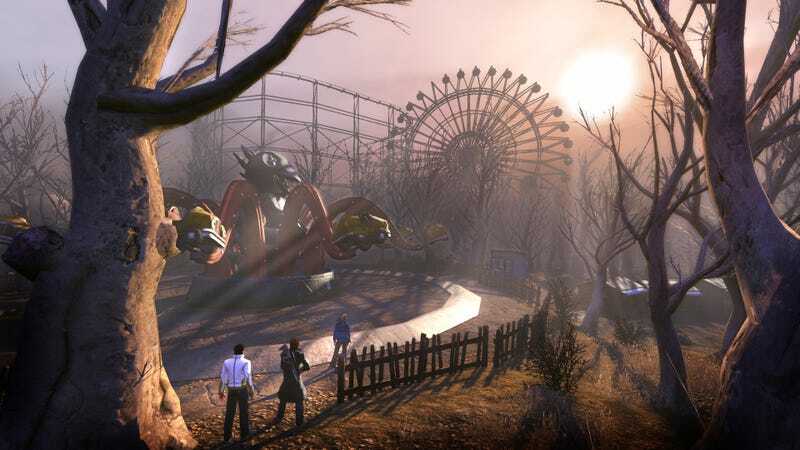 But only The Secret World follows up hell with a visit to a demented theme park. Funcom's Craig Morrison escorted a group of game journalists through this dark and twisted amusement park last week, and I was fortunate enough to be on that ragtag Scooby Doo crew as we saw the sights, went on rides, and killed creatures born of nightmare. You know, the usual. The carnival trip began with a visit to a non-player character, the son of the previous owner of the park in question, eager to reclaim what is his. From the relative safety of his town car he instructed my team to infiltrate, investigate and eliminate any ghosts and goblins that might place themselves in our way; many have tried, none had succeeded. This sounds like a job for player characters! Sans healer but grouping for solo combat, our team made quick work of any foe we encountered, thanks to premade characters loaned to us by Funcom for the occasion. My mohawked supernatural soldier wielded a shotgun and a claw, but the most potent weapon in his arsenal was a power called Hammer of Thor, a devastating attack that blasts the enemy with lighting. Coupled with a skill that guarantees a critical hit for the next attack, it was a potent combination that earned me the attention of just about every creature we encountered. The quest we were on led us through the park, attraction by attraction. At the tilt-a-whirl we were forced to dodge the deadly spinning cars while waves of enemies charged us. The dangerous attraction was a boon as well as an electricity-spewing hazard, we soon discovered, as enemies caught up in its mad whirling were killed as readily as we were. Then we rode the roller coaster. The game's cinematic engine shifted us to a first-person view for the harrowing ride, dark spirits taunting us at every turn. There was no combat, just this wonderfully bizarre bit of back story, delivered in a completely unique fashion. As we made our way to the muddy remains of what was once the Tunnel of Love, my screen flickered and crackled erratically like something out of a Japanese horror film. This was no glitch in the system. Funcom employs special filters to add atmosphere and tension to the game. There's heat haze in Egypt, there's screen static at the fair. Later in the demo I realized that every screenshot I tried to take of the character I played was distorted. "Wait, is the game pulling a funhouse mirror distortion effect on us?" I asked. After a boss fight in the mud, which slowed our movement as we attempted to take down some sort of muck creature (again, shades of Scooby Doo) and a brief trip to the ferris wheel (we were not dead enough to ride that ride), our tour culminated in a battle amongst the bumper cars. The cars moved of their own accord as a chainsaw-wielding maniac attempted to separate our innards from our outtards, but our dodging skills were strong. He went down like a sack of... guy with a sack on his head. As our tour led us into the shimmering deserts of Egypt and on to darkest Transylvania, my mind stayed in that rickety amusement park on the coast of New England. Sand and mummies I've seen. Vampires? Please. But exploring haunted theme park rides with a group of players while the very air distorted reality around us? That's all The Secret World, a dark-mirror reflection of the place we live that's unlike any other MMO setting around. I'm looking forward to making my adventures permanent come July 3.